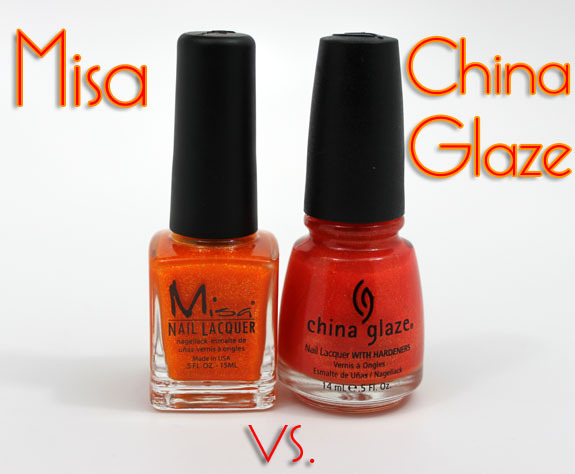 Home China Glaze	Misa Endless Keys vs. China Glaze Orange Marmalade – Reader Request! 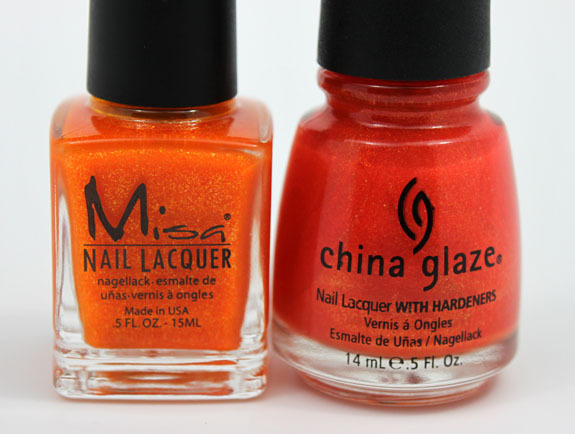 Misa Endless Keys vs. China Glaze Orange Marmalade – Reader Request! Welcome to another edition of “vs”. 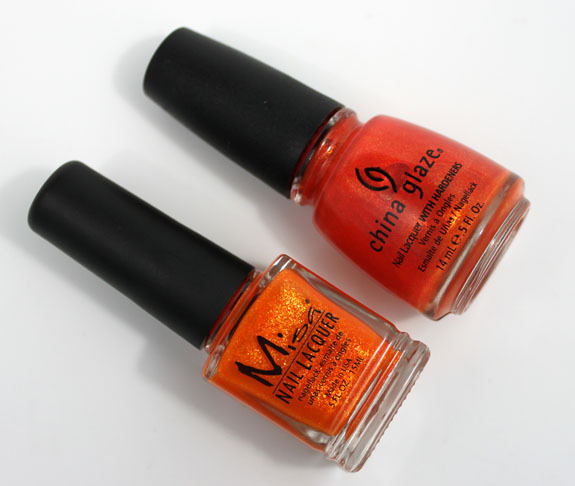 This time, per reader request, we are pitting Misa Endless Keys against China Glaze Orange Marmalade. Let’s start with the similarities here. First off, obviously, they are both orange. Second, they both are glass flecked with strong yellow shimmer. Third, they are both warm toned oranges. Fourth, they both have great formulas. Misa’s Endless Summer is the newer color, having just released not too long ago. 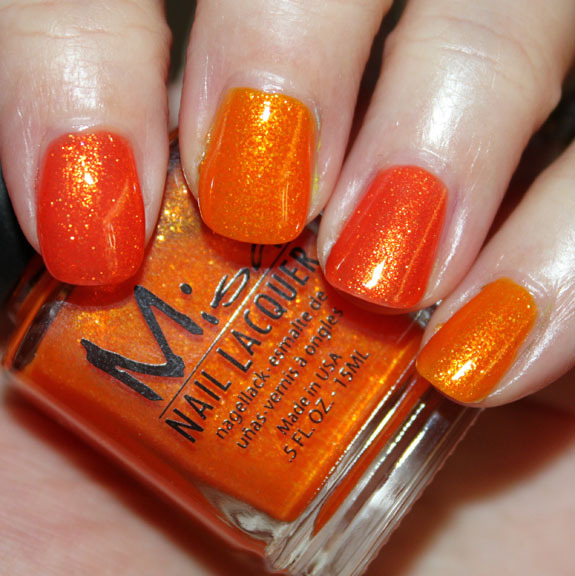 Endless Summer is a tangerine orange with a strong yellow shimmer to it. This is definitely a different color orange from Orange Marmalade, it’s lighter and much more yellow. The glass-fleck effect seems a little stronger in this one and a bit more of a “turned up” yellow than in Orange Marmalade. 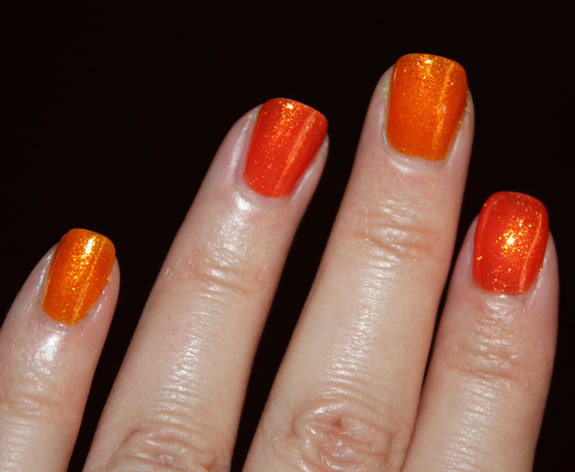 China Glaze’s Orange Marmalade came out a couple years ago. It’s a warm medium orange with strong yellow shimmer. It doesn’t have the tangerine color of Endless Summer though, it’s much more of a deeper, classic orange color. The yellow flecks aren’t quite as pronounced as with Endless Summer, but definitely still really strong. The formula for both of these is pretty nice. Both start off on the sheer side and seem a little thin, but after three coats they are totally opaque and gorgeous. Once you see them next to each other it’s pretty obvious that they aren’t the same kind of orange. One is more tangerine, one is more of a “safety” orange. Really it comes down to your preference. They are definitely different enough to own both without feeling like they are the same color orange. If I had to pick between the two I would go with Orange Marmalade just because I think it goes with my skin tone a little better. I am taking reader requests and will do my best to cover whatever I currently own. I have a few already in the works, but let me know if you have any ideas of comparisons you would like to see in the comments. Also, since I do still own a lot of polish by companies I don’t show anymore (because of animal testing – I don’t buy or review new colors) I will use them for comparisons if a good one comes up. Great comparison! I have Orange Marmalade somewhere in my stash. Your swatches are making me want to dig it out. Ooohh, I love both of these glass-flecked oranges. Can’t choose my favourite! Love them both! I have Orange Marmalade, but haven’t worn it yet. Not sure if I will buy the Misa, though. Can you show us all the dark plum OPIS? William tell me about OPI, Lincoln Park, We’ll Always Have Paris? Yes I can-can? Anything in that range? Seems like they are all the same! And also Orge the Top Blue, No Room For the Blues, Suzi Skies? wait, not suzi skis. i think suzi says feng shui is the blue one? OOoh…..Orange Marmalade is the perfect orange ! Can you do a comparison of OPI Suzy Says Feng Shui and Zoya Breezi? I did that comparison on my blog and I’ve seen it on a few others. They’re as dupey as you can get. You definitely don’t need both. BMR´s last post…Kreativ Blogger Award! I wish I could get into orange polish. These are both beautiful, but I have some kind of aversion to wearing orange. If you have the colors, I’d love to see Deborah Lippmann’s I Know What Boys Like compared to Misa’s Throw Me Something Purple Please and American Apparel’s Mount Royal. Thanks! I love these vs. posts! They’re so much fun to read! These are yummy. Now I want an orange push pop. Remember those? I don’t have either of those colors, sorry! And Essie doesn’t test themselves but they are owned by L’Oreal now, so I don’t buy new ones from them anymore. I have Orange Marmalade and it’s gorgeous. I have to get Endless Summer. Love glass flecked polishes. Great comparison! 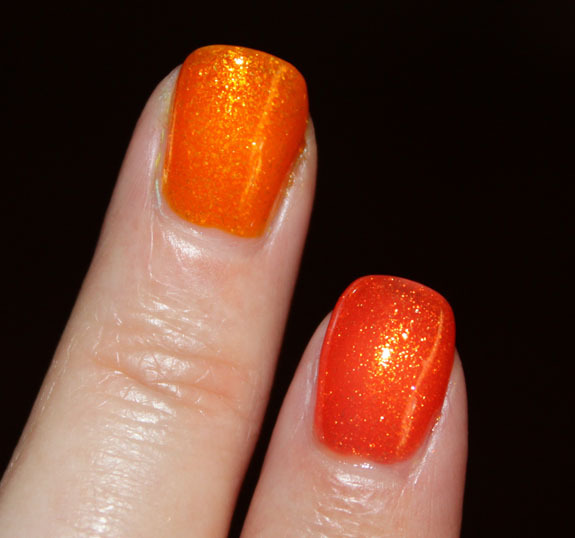 Can you please compare FingerPaints’ Psychedelic Sunshine to China Glaze light house? The China Glaze is so attractive, but I adore Misa’s formula. Hard choice!! !